3 years ago I picked my knitting needles back up after nearly 40 years! I find knitting small items like dishcloths and washcloths so relaxing and you can make them out of 100% natural cotton, in any color or pattern you want, for any color scheme, in any size! It's a great feeling washing dishes with a dishcloth you made all by yourself! Will absolutely loves using homemade cotton washcloths for washing up, especially with my homemade soap! I make his cloths in manly colors and extra large, but for the women in our family I love making these pretty round washcloths! I found this pattern on the Internet, written as a newspaper article by Ardeana Hamlin, BDN Staff. The title of the article intrigued me . . . With a little faith, round dishcloth knits up quick. Ardeana speaks of a time before copy machines, when simple patterns like this one were handwritten or a friend or relative would take the time to show you how to make the item, while you took brief notes to help you remember the steps. 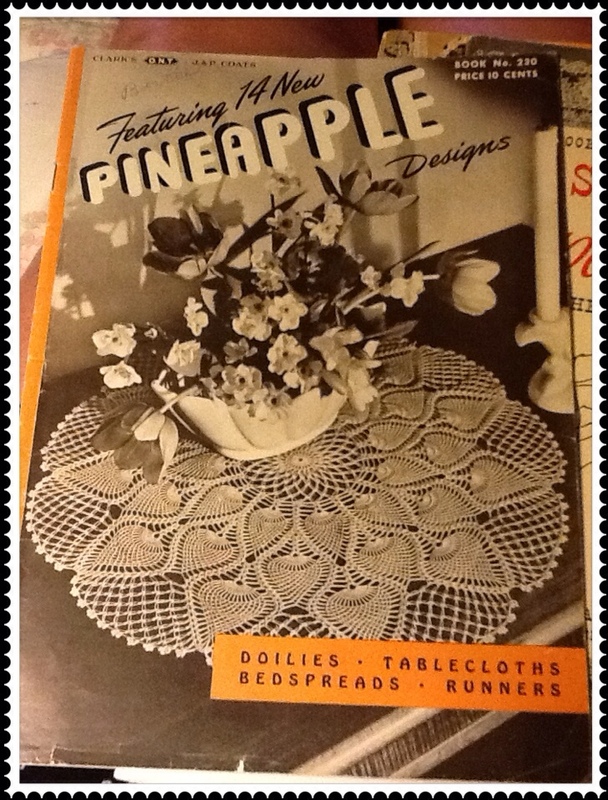 They also sold small booklets for a dime filled with patterns for lace doilies, tablecloths, bedspreads, runners, trims for dainty hankies and pillow cases . . . everything a blushing bride to be, would need to keep the perfectly appointed home! This 31 page knitting booklet by The Spool Cotton Company, has a copyright of 1946 and sold for 10 cents! This round pattern was handwritten for Ardeana by her sister. 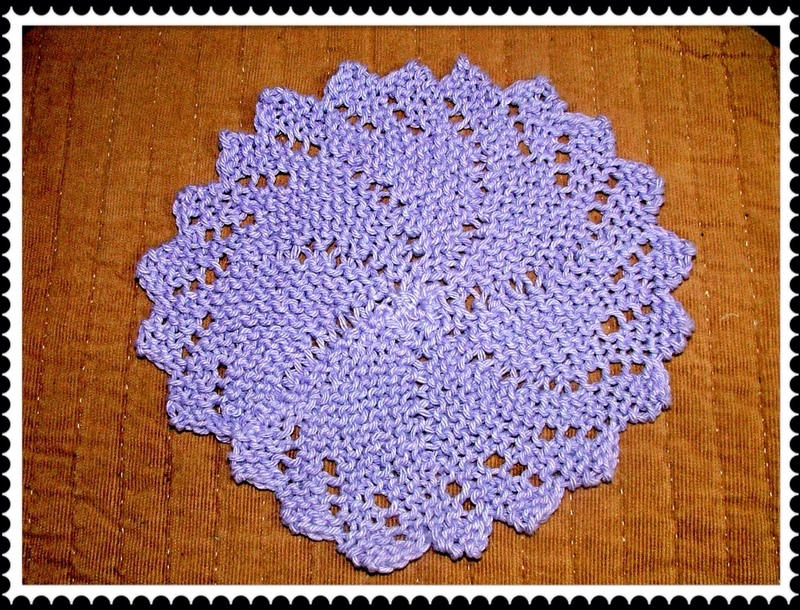 It is a lovely pattern that can be used as a dishcloth or pretty washcloth! The pattern is quite simple, and really fun to knit and I love the lacy holes that are created by a simple yarn over (YO). Here's is a quote by Ardeana, "The pattern is fun to do because even though it doesn't seem like it at first, the resulting dishcloth does, indeed, turn out to be a round. It's one of those patterns that require faith. Just do it and it will come out right. That's because it's knit in a series of wedge-shaped pattern repeats. Each pattern repeat consists of 20 rows, and those 20 rows are repeated seven times. 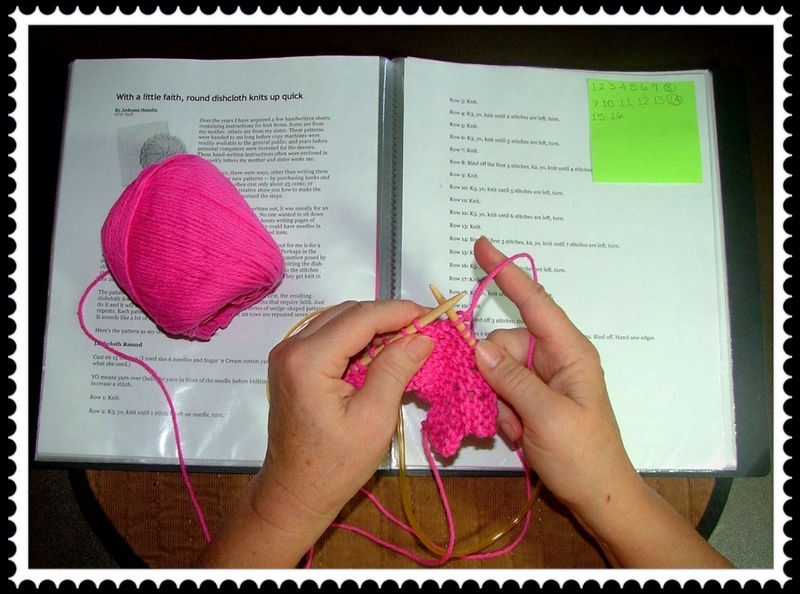 It sounds like a lot of work, but it knits up fairly quickly!" YO means yarn over (hold the yarn in front of the needle before knitting the next stitch) to increase a stitch. Row 2. K3, yo, knit until 1 stitch is left on needle, turn. Row 4. K3, yo, knit until 2 stitches are left, turn. Row 6. K3, yo, knit until 3 stitches are left, turn. Row 8. Bind off the first 3 stitches, k2, yo, knit until there are 4 stitches left, turn. Row 12. K3, yo, knit until there are 6 stitches left, turn. Row 14. Bind off the first 3 stitches, k2, yo, knit until 7 stitches are left, turn. Row 16. K3, yo, knit until there are 8 stitches are left, turn. Row 18. K3, yo, knit until there are 9 stitches left, turn. Row 20. Bind off 3 stitches, then knit to end of row. Repeat rows 1-20 6 more times for a total of 7-wedge patterns. Bind off. Hand-sew edges together to complete the circle. I find bamboo circular knitting needles the most comfortable to use. 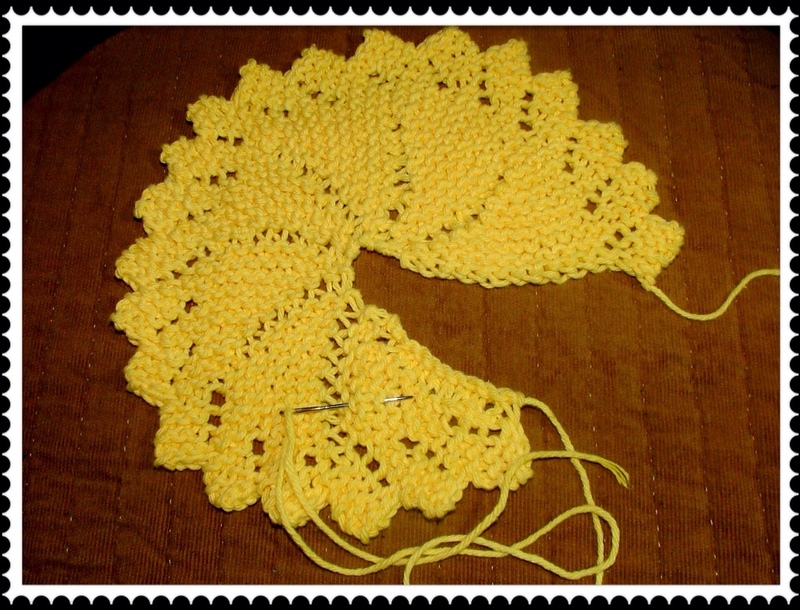 This is a completed round cloth before it is sewn together. I'm making these dainty washcloths and a floral bar of soap for each of my granddaughters for Christmas this year. Shhhhh! Please don't tell them! It's a secret! There's a lot of knitting and soapmaking going on . . . Over at Julie's!! !